At Discount Art N Craft Warehouse you can find all your favourite products at discount prices. Are you a fan printmaking? 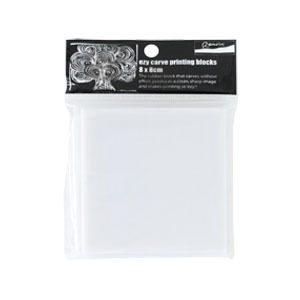 Discount Art N Craft Warehouse supplies Ezy Carve Printing Blocks for use with block printing inks, acrylics and relief inks that won’t crack or dry out. Ezy Carve Printing Block is smooth, high quality, double-sided and made from rubber, making it easier to carve into than lino. Reproduce artwork without gaps or hollows and store your printing block safely for years. Not sure where to start? Try using your Ezy Carve Printing Block to make your own napkins, table cloth, T-shirt, curtains, gift tags or birthday cards. Not sure printmaking is your thing? Then check out the other projects you can tackle with Discount Art N Craft Warehouse using supplies like paints, canvas, markers, calligraphy, construction, clay, airbrushing and mediums and varnishes. Discount Art N Craft Warehouse really does have everything you need for exploring the world of art and craft. Be it printmaking, drawing or sitting down to a kids activity, Discount Art N Craft Warehouse has you covered.